Ultimately we want you to be completely satisfied with your purchase and we are committed to providing a pleasurable shopping experience. We have compiled the following terms and conditions which in no way affect your statutory rights. These terms and conditions cover all purchase made, on-line, via email, phone or with the exception of the distance selling clause in person at our premises. All items are sold singly unless otherwise stated. The Team @ IBEX Camping make every effort to ensure that products offered on the website are in stock. Should the situation arise where a product is temporarily out of stock or is supplied direct from our supplier or is an ex-stock item from our suppliers with a 2/3 day delivery timescale . Therefore placing an order with us doesn't always guarantee availability. In the event that your item is out of stock our customer services team will contact you to advise our re-stocking date & expected delivery date if acceptable our closest alternative product will be offered. Should this not be acceptable a full refund will be issued. Ex-stock / Drop Ship Delivery from our suppliers : our customer services team will contact you to let you know your expected delivery time - if your happy to proceed the order will be processed. If not, then a full refund will be issued. Every effort is taken to ensure that the items listed withing this website are accurate and correct. Item specifications & images are supplied by the manufacturer/our supplier and are to the best of our knowledge correct. IBEX Camping cannot take any responsibility for any errors or ommissions and reserves the right to alter pricing or specification. Should an error occur we will try our best to rectify this , we do though reserve the right to in exceptional circumstances cancel the sale. Purchases can be placed via this shop, phone or in person directly from our premises. We are delighted to receive orders from within the uk and associated Islands , we will try to satisfy orders placed outside the uk however these may be subject to extra charges. Shopping from overseas - simply select the Quote for Shipping Delivery service and we'll get back to you with a price - once your happy we'll proceed with you order. A confirmation email will be sent following your purchase. If your order is urgent please phone 01480 40 40 30. We accept payment by Bank Transfer , Cash or cheque , Or via Debit/Credit Card using one of our Third Party Payment Gateways as offered via the Website. Items will not be despatched before cleared payment is received. We can despatch up to 25kg for only £3.95 3/5 Day Courier Service or £6.95 for a 24 Hour Service.Our Primary delivery couriers are UK Mail and Royal Mail however we have access to variety of couriers and services to ensure the best possible price. Smaller items are usually sent using Royal Mail. Shipping costs are calculated on weight using a Volumetric Weight Calculation. Orders received before 2.00pm will be processed the same working day - orders recieved after this cut off time will be processed the next working day. If this is not the case we will contact you via email or Telephone. Orders despatched using UK Mail will recieve a confirmaion Text or Email for an hour Timed delivery slot prior to your delivery day. 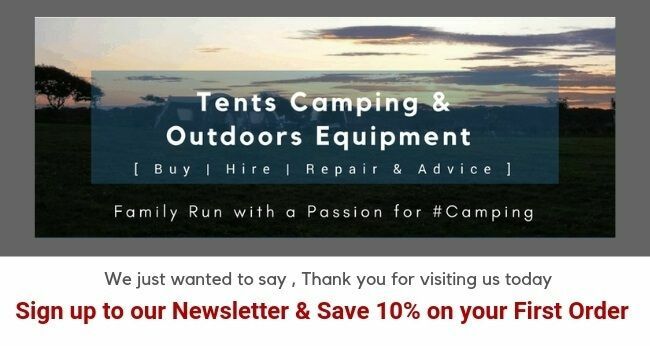 If your item is urgent please call 01480 40 40 30 or email sales@ibexcamping.co.uk. You have the right to cancel your purchase and return your purchase within 14 days of delivery . To cancel your purchase please email us or call 01480 404030 items must be received @ IBEX Camping within 14 days. If you cancel this purchase, we will reimburse to you all payments received from you, including the costs of delivery (except for the supplementary costs arising if you chose a type of delivery other than the least expensive type of standard delivery offered by us). We may make a deduction from the reimbursement for loss in value of any goods supplied, if the loss is the result of unnecessary handling by you. You are responsible for all return postage costs. If you need any information as to the cost of returning an item before purchase please get in touch with the Team @ IBEX Camping and we will provide an estimate. If you are not fully satisfied with your purchase you may return your item within 14 days. Items must be returned with proof of purchase , in an unopened, unused condition with original labels attached. Return postage at your (our customers) expense. If you don't require a replacement item, we'll issue a refund less our postage charge once the returned item is checked and returned to stock. We will happily refund or replace items not suitable due to size as long as items are returned with all labels still attached and in an unworn state. Return & Replacment items Postage at your (our Customers) Expense. In the case of faulty goods due to a manufacturing defect we will provided the item has been used for the purpose it was intended offer a repair, refund or replacement at our or the manufacturers discretion. Please note that this policy does not cover reasonable wear and tear, accidental damage, misuse or neglect. Tents must be returned in an unused condition with all original packaging and labels attached. Tents must be returned in a dry condition. Any tent returned with signs of having been pitched outside will be considered as used. We reserve the right to charge a 10% fee for re-packing Tents. We reserve the right to deduct 20% from the price paid for Tents returned & considered used. We are only able to refund postage costs (up to the value of our standard delivery service in the event of Faulty goods or an error on our behalf. The cost of return can vary , please get in touch with the Team @ IBEX Camping for up to date estimated costs. In the event of a refund being issued . This will be processed by the method used for the original payment - IBEX Camping cannot be responsible for any transaction charges resulting from a refund. Please allow us time to process your return and issue your refund up to 5 working days. The information contained in this website is for general information purposes only. The information is provided by IBEX Camping and while we endeavour to keep the information up to date and correct, we make no representations or warranties of any kind, express or implied, about the completeness, accuracy, reliability, suitability or availability with respect to the website or the information, products, services, or related graphics contained on the website for any purpose. Any reliance you place on such information is therefore strictly at your own risk. Through this website you are able to link to other websites which are not under the control of IBEX Camping. We have no control over the nature, content and availability of those sites. The inclusion of any links does not necessarily imply a recommendation or endorse the views expressed within them. Every effort is made to keep the website up and running smoothly. However, IBEX Camping takes no responsibility for, and will not be liable for, the website being temporarily unavailable due to technical issues beyond our control. All copyright, trade marks, design rights, patents and other intellectual property rights (registered and unregistered) in and on our website and all content (including any applications) located on the site shall remain the sole property of IBEX Camping or its licensors (which includes other users). SSL - Our shopping cart provider EKM Powershop provides our SSL. We sincerely hope that the service you receive from IBEX Camping would be to the same level as we ourselves would expect - however please address any complaint to sales@ibexcamping.co.uk in the first instance - we will endeavour to respond to you within 48 hours.